Number of inhabitants (1 Jan 2003): 25.907; area: 9,61 km². Settlements: Heemstede (seat). This flag was composed in 1925 by Mayor and Aldermen on the occasion of an exhibition. The flag was not officially adopted, but was used for special occasions. It was adopted by the municipal council on 26 Aug 1982. 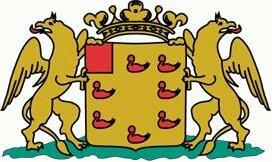 The colors are derived from the municipal Coat of Arms. image from the Heemstede municipal website.